34 years and seventeen albums in, it's good to see that New Jersey thrashers Overkill are still waving the metal flag proud. 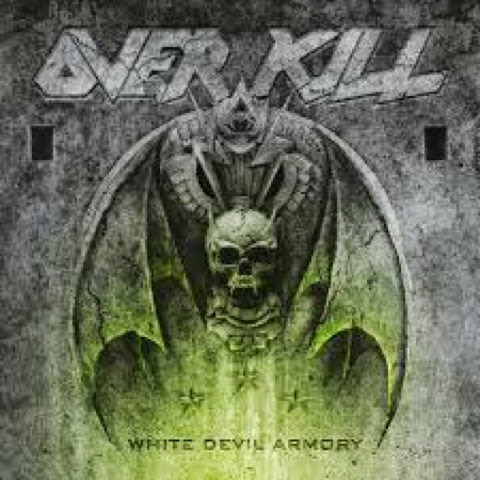 Following up on their recent string of high quality albums comes "White Devil Armory". Barely breaching the 50 minute mark, almost all of the 11 tracks are quick bursts of thrash. Opening up with the intro"XDM" then coming right out of the gate with "Armorist" which has one of the best chorus' on the record. The stampede of adrenaline based riffs continue throughout the entire record without even having a mid tempo song. The vocal delivery of Bobby Blitz is the same as it has always been which I really enjoy. However, I know a lot of people who are turned off by this band because of his voice. Despite his age though, his snarl is still up and kicking in full form. The instruments here are incredible. Especially thanks to (bassist) D. D. Verni. The biggest drawback here is the lyrical content. It's full of macho man bravado and aggression but it comes off as cheesy as a Hulk Hogan movie. This album is repetitive and isn't as strong as their past slew of releases but it is still a fun, fast beat down that should be in amy thrasher's collection. If you're a fan of this band, buy it. You'll enjoy it. If you're trying to check them out for the first time, this may not be the best starting point. "King Of The Rat Bastards"